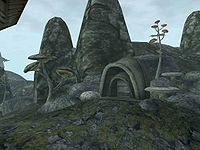 The Aundae Clan, a vampire clan led by Dhaunayne Aundae, can be found in the Ashmelech cavern (on the medium sized island far southwest of Dagon Fel). They are a dark brotherhood of vampiric mages "blessed" with dark powers of the mind; their path through the darkness relies on their mastery of magic. The Aundae Clan consists fully of Altmer, but with Dunmer and Redguard cattle. Aundae clan members receive a bonus of +20 to Willpower, and +20 to Short Blade, Mysticism, and Destruction. There are also other vampires of the Aundae bloodline who don't belong to the Clan. They can be found at the Sarethi Ancestral Tomb (northwest of Dagon Fel), the Dulo Ancestral Tomb (west of Uvirith's Grave), and the Aralen Ancestral Tomb (south of the Zainab Camp). "What do you want, New Blood?" "We are the dark walkers, those who prey on the warm blooded. Our gifts are many, and weaknesses few. There are three major clans: Aundae, Berne, and Quarra. There are others in this world as well, living like cattle in tombs under the ground." "We are the most blessed of all of the cursed. In addition to the powers all vampires possess, our dark powers are of the mind, where other, weaker clans are gifted more physically. Our path through the darkness relies on magic, and at this, we are truly gifted." "As is obvious, we are stronger, faster, more focused than normal creatures. You will find your body lacks the frailties of the normal man or mer. Disease is nothing, and those who would seek to paralyze you will always fail. We float through the night air with ease, always watching. And, of course, we can drain the warmblooded ones with but a touch, restoring our own life force." "As an Aundae, you will find your mind even more powerful than vampires of other clans, and your spellcasting unparalleled. We have achieved perfection of the mind and the body. We are sublime." "This clan above all disappears into the night. Not blessed with the magical powers we are given, they rely on stealth to claim their victims." "Brutes. Ugly and foolish. Offensive to the eyes. They live and feed through sheer physical strength. And they are strong, dark walker. "What are you doing here? What can I do for you?" The Vampire Hunter: Kill a vampire hunter from Ald'ruhn who has been seen near the headquarters. * Judging from their IDs, these two cattle should be Bretons, but for some reason they are Dunmer instead. Lorurmend wears an expensive robe with a matching ring, amulet and shoes. She wields a chitin shortsword in melee combat. Lorurmend knows the spells Summon Greater Bonewalker, Vampire Toucch, the same self-affecting spell Iroroon used, Far Silence, and Summon Scamp. Mirkrand wears an expensive shirt with shoes and a pair of pants to match. She has no weapon and fights instead using unarmed combat. She knows the spells Toxic Cloud, Wild Distraction, Blood Despair, and Dire Weakness to Shock will come back and learn more from her later. Moranarg wears an exquisite shirt and expensive pants with shoes and a ring that match his pants. He knows the spells Wild Distraction, Blood Despair, Vampire Touch, Dire Weakness to Shock, Dire Weakness to Poison, Daedric Bite and There's probably more, I crashed so I'll record more from him later. He uses Iroroon's self-cast spell though . He has no weapon, he instead fights unarmed in melee combat. Tarerane wears an expensive shirt with a matching skirt and shoes. She also carries around a chitin shortsword for self-defense. She knows the spell Poisonbloom, Shockbloom, Wizard Rend, Vampire Touch, Lightning Storm, . Tragrim wears expensive pants with a matching shirt and shoes. He knows the spells Summon Clannfear, Toxic Cloud, Vampire Touch, Drain Destruction, Drain Enchant, and Wizard Rend. He carries no melee weapon, he fights using unarmed combat. This page was last modified on 28 January 2019, at 07:52.